What is a ‘Yogic Block’? This is something I feel will resonate with many of you! It’s February, and even though the long weeks of January are behind us, for many of us in the Western hemisphere the weather is still veering from cold and windy to absolutely blisteringly freezing. The hours of daylight still feel too short and in no time at all, after work, kids, general stuff that I like to call ‘Life Admin’, the evening has drawn in and it’s all too tempting to get on the sofa and call it a day. Even here in Ibiza, where we’ve been lucky enough to still have some very welcome afternoons of sunshine, the hours of daylight are much shorter and the evenings have been very cold and windy. Also, Ibiza has quite a transient community, where many people head off to sunnier climes in the Winter months – it honestly feels like half of Ibiza (or at least those who don’t have kids of school age) are in India, Sri Lanka or Mexico right now! I’ve definitely been fighting off my own Yogic Block in the past couple of weeks. My partner is away in the UK on business, so my routine is very different from normal. I foolishly thought I’d have lots of extra time for practice, for study and for trying out new classes and teachers. The reality has been a daily battle to organise and motivate myself to fit in my practice around work, the school run and pick-up for my daughter, ensuring she and all the household animals are fed plus a multitude of extra household tasks, that are normally shared between us, to keep the cogs of the family wheel turning. So I thought I’d share some tips that have helped me – pretty much – keep my practice on track. 1. Plan your week’s practice. Are you planning some classes or will your practice all be at home? Check out the days and times of classes you would like to attend and put them in your diary. Let the teacher know you are going to attend – this is a really good nudge to get you there, as we all know how rude it is if you tell a teacher to save you and space and that you will definitely be there, only to not show up – possibly taking a space for someone else. Yes, I’m suggesting you guilt yourself into going! 2. If you are planning on attending a morning class, get all your stuff ready the night before. Get your gear together, lay your yoga pants out, fill your water bottle, make sure your car-keys are where you expect them to be and if necessary make sure you have the cash for the class. If you have to stop at the petrol station or a cash point in the morning, you’re giving yourself a ‘get-out’ clause. Basically, prepare all the things that could potentially stop you going! 4. If you are planning on practising at home, keep your mat somewhere where you can see it. Don’t put it in a cupboard or leave it in the boot of your car. Keep it somewhere where it can’t be ignored. If possible, roll it out ready for action. It doesn’t matter if your cats or dogs spend more time lying on it than you do – as long as you get onto it at some point. 5. Home practice requires a bit of its own discipline, so plan your practice beforehand. It can be quite demoralising if you get to your mat, with all your gear on and your blocks and strap ready for action, then you realise you don’t really have a practice planned. When you are actually having some sofa time, maybe the night before, have a browse through the gazillions of websites that have online practices you can follow. Save a variety of practice types – energising morning flow / soft, grounding yin – depending on what time of day you’ve booked yourself in for time with your mat. I love gaia.com or DoYouYoga.com. Some sites have small monthly subscriptions, but if you’re going to be committed (which of course you are!) they work out as great value, and most have plenty of free sequences to follow. 6. 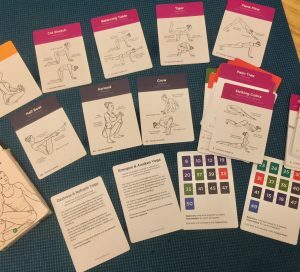 Another great investment I have made for my home practice has been Yoga Cards by WorkoutLabs. 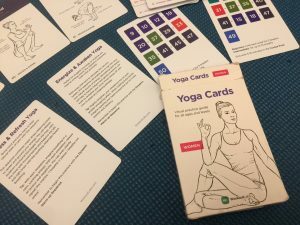 You can buy them online and they are basically decks of cards with over 100 asanas, with detailed instructions, tips and prompts so you can build your own sequences. They also have pre-formatted guided sequences of different types that you can lay out next to your mat and follow. 7. Make your mat feel inviting! Light a candle and some incense. Choose a soundtrack for your practice. There are some brilliant Yoga playlists on Spotify, or you are welcome to use my playlist I put together that has a lovely flow to see you from gently awakening of the spine, through a flowing vinyasa practice and finishing with some delicious mantras for Sivasana. Arrange some crystals around your area and make the space feel sacred and inspiring; this is where you are coming to honour yourself and your practice, so give the space the respect it deserves and that you deserve. I hope some of these tips will help you to keep to your practice during the dark Winter months. Remember – just showing up to your mat every day is enough! Even if all you manage is Child’s pose, some Cat / Cows, then a lengthy Sivasana, from a simple start, this regular habit will grow and the more you show up, the easier it becomes to make this regular practice your very own daily sanctuary. If you would like to join us on retreat to kick-start or deepen your practice and really develop a beautiful relationship between you and your yoga mat, check out our calendar of transformative and inspiring retreats for 2019.
https://ibizaretreats.com/wp-content/uploads/2019/02/IMG_8819.jpg 1426 1014 Ibiza Retreats https://ibizaretreats.com/wp-content/uploads/2018/02/ibiza-retreats-trans-300x138.png Ibiza Retreats2019-02-06 20:42:332019-02-06 20:42:33Help! I'm having a Yogic Block! As Ibiza Retreats is now into its 10th Anniversary year, we are celebrating by selecting some wonderful, unique and very important charities that we will be supporting for the next part of our journey as our business continues to grow. Their purpose is of bringing yoga into the lives of people in desperate situations, refugees in war-torn countries, and also those that are known as ‘urban refugees’ who may not have been displaced but are living in catastrophic conditions in war zones or areas previously destroyed by war. They do this by providing specialist Trauma Informed Yoga training to yoga teachers, to equip them with the very unique skills to approach from both a yogic perspective and from an understanding of trauma sensitive practice and trauma release exercise. “Supporting people with trauma is a core benefit of the practice and wisdom of Yoga. Please read more about them on their inspiring website and follow them on Facebook to see their work in action.